This weekend was supposed to be filled with fish spearing, followed by fish eating. You wouldn’t expect anything less when waking up at 4:15am on a Saturday morning. We took off from the boat ramp as the sun was rising. Boy was the water choppy. A bumpy ride out to our first stop took us to clear water, but no fish. We moved on to another spot which looked a little bit green but clear enough to jump in and do a drift dive. Not much going on in this spot. 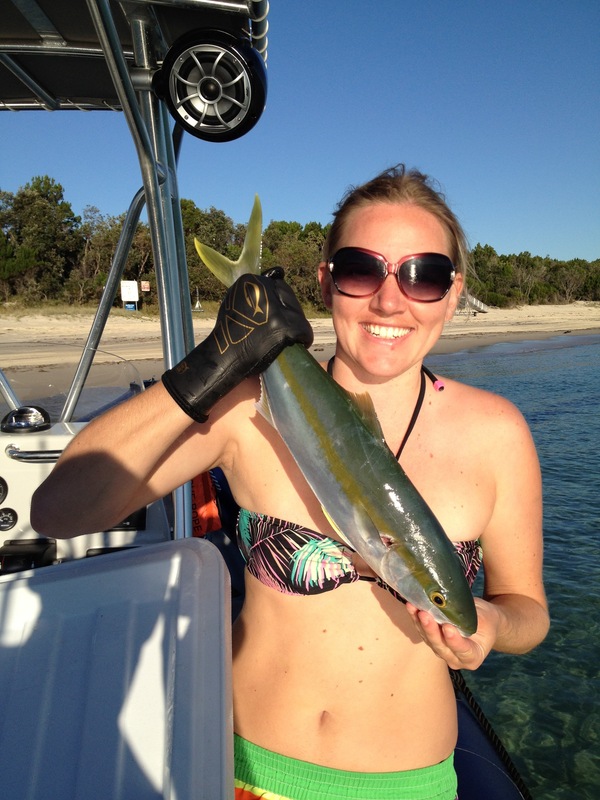 One of the guys managed to get a decent sized Tuskfish (I think that’s what it was). We decided to move on to another spot. We did a drift and the same guy who speared the Tuskfish found a stray Spanish mackerel and speared that. It wasn’t as big as the one Ryan speared when we speared in Townsville, but it was still a good one. Check out Ryan’s by clicking here. We thought for sure its friends would be hanging around and so we did a couple more dives at that spot. Then came the dilemma. Do we keep trying the spots that are kind of visible or move elsewhere to see if there are more fish? We pondered this question over some Christmas cookies my mum had provided me the night before. The decision was made to try another spot. It was a bit of a drive and the further we went the greener the water became. Uh oh. Just as we were about to arrive at the next spot we drove past a medium sized shark floating towards the top of the water. We think it was a leopard shark so nothing too bad to worry about, but still a reminder they are there. The boys put on their masks and had a look in the water. They confirmed the visibility was terrible. Bummer. There was no way we were getting in green water in one of the sharkiest spots ever. On we went. The water did not improve much at all. We found one more spot with just enough visibility but it was only about 4 meters deep. There was a chance we might find some crayfish, but they hid too well. Oh well, that was the day done. We are welcoming the southerly change that arrives this week. It should bring in some clear water. Ok, as you can see I did not support my story with any photos. I was slack this weekend. It made for a good Kingfish ceviche. Delicious. What a beautiful fish!!! Congrats!